I have been an ‘artist’ of sorts all of my life. I was educated at The Hewett School, Norwich, where for me the most significant figure was my art teacher, Lesley Moore. Lesley was a gentle man, a brilliant teacher, and today I am proud to be the owner of two of his large water colours. Of all my teachers, he is the one I remember most fondly. In truth, little else made much impression on me. I became an Art Teacher in 1968, after three years studying in Liverpool, and I have enjoyed teaching Art in various parts of the country for the following forty years. Although over half of my forty years spent in education was spent in Headship, or as a College Principal, it was in the art classroom where I was always most at home. I was never meant to be a ‘Manager’. My life has been at it’s best when chasing dreams. This was as true of my time as a Headteacher or Principal as it was when I turned my hand to other occupations or pastimes, such as truck driving, coach driving, musician (of sorts), entrepreneur or Company Director. As an Artist I have also always spread myself thinly: a painter, a potter, print maker or sculptor. I am: Francis Callaghan; B.Phil; M.A; F.R.S.A; I.A.M, and whatever else you care to anoint me with. Now residing in Lymington, I describe myself entirely as a Painter. I sell my work through my website, which also brings in commissions, which I enjoy. I will tackle most subjects, but not animals. 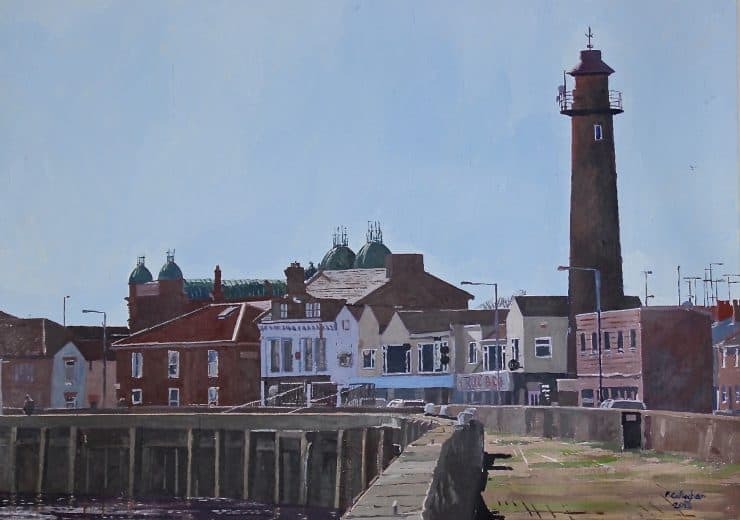 You will see from my paintings on this site, that my subject matter is diverse, and I particularly enjoy painting busy town scenes, marine subjects and figure. Although I now live in Lymington, and before that over twenty years in the heart of the New Forest, my heart remains in Norfolk, and it is the landscape of large skies that still motivates me most. It’s too late now to return there, but it’s where my soul will always reside. I paint mostly in oil or acrylic, but sometimes I venture into water colour and pen. I paint what I see. I cannot paint abstract, so I don’t often try. I have sold my paintings internationally across the globe, on all continents except Africa, and I exhibit with the R.A; R.S.M.A and R.I.O.P. Some of my work is always on sale at Bridges of Lymington. I am happy to discuss any ideas that you may have for works of art, for the home or for the workplace.